NOTES: Long out of production and very short run. During the Second World War, Spain was keen to build (under licence) the very successful Messerschmitt Bf109 fighter, and thus an agreement was entered into which would see the airframes of several Bf109G-2s shipped to Spain for assembly by Hispano Aviacion with Daimler-Benz engines (as well as weapons, instruments and other miscellaneous components) also coming from Germany. In the event, however, Germany could barely meet her own manufacturing needs so only around 20 airframes – minus engines – arrived in Spain and these were built with Hispano-Suiza engines up front. Eventually, by 1954 it was decided to trial a new development fitted with a Rolls-Royce Merlin. This version entered production as the HA-1112-M1L, with about 170 units being delivered. Due to the deep “chin” cowling the aircraft earned the nickname of Buchón, this being a deep-breasted pigeon native to Seville. The Buchóns would serve with the Spanish Air Force for another ten years, well into the jet age despite their apparent obsolescence. By the late 1960s the Spaniards were close to retiring the type, and coincidentally Bf109s were required in large numbers for the upcoming epic motion picture Battle Of Britain, so veteran bomber pilot Hamish Mahaddie acquired around two dozen Buchóns. These, along with several CASA 2.111 bombers (licence-built Heinkel He111s, also powered by the British Merlin) were painted by the Spanish Air Force into Luftwaffe camouflage and flown from Tablada air base for aerial combat and ground scenes, and later ferried to Britain for the mass dogfights which make the film a must-see for old aircraft enthusiasts. The film-star Buchóns were then sold off, four being purchased by members of the US Commemorative Air Force, a handful to British enthusiasts and around a dozen to American pilot Wilson Edwards, who still has the machines at his Texas airfield, still in original film paint and condition. The other, Spanish-based Buchóns also found new homes elsewhere and continued to play the role of Bf109 at airshows and for film and television productions such as Memphis Belle, Piece Of Cake and Pearl Harbor. Today around half a dozen remain airworthy, with another few under active restoration to fly. A couple of Buchóns are on display in Spain and the US in their original Spanish Air Force colours, whereas the airworthy airframes wear WW2 Luftwaffe colour schemes. One UK-based aircraft has recently been repainted and modified into its Battle Of Britain “Bf109e” appearance to commemorate the type’s most well-known claim to fame. Three are owned by the Messerschmitt Foundation in Germany and have been re-engined with Daimler-Benz engines and these appear at air shows across Europe as Bf109Gs. 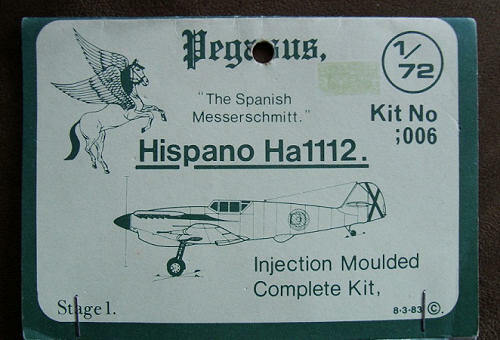 Not many kits of the Buchón have been produced as far as I’m aware, those around being the 1:48 kit shared by Hobbycraft and the more readily-available Academy, and this 1:72 short-run kit produced by Pegasus in the UK. I have had a lifelong fondness for the Buchón – an example owned by the Old Flying Machine Company in the UK made a well-publicised appearance at a Kiwi air show in 1992 and growing up I would watch again and again the video of the show, watching Mark Hanna put G-BOML through her paces. As a result I’ve longed for a kit of the aircraft and I’ve already built the Academy 1:48 kit, so when the Pegasus model popped up on a local auction site I jumped at the chance. This is not a shake-and-bake, weekend kit by any stretch of the imagination. Opening the bag, which I might add had been unopened since being stapled shut in 1983 after leaving Pegasus, out comes three sprues and some sadly loose or broken parts. No decals are provided, the instruction list is printed on the header card and a 1:72 three-view showing placement of national insignias is provided. Recommended paints by Compucolour(?) are listed as are sources of decals. The fuselage halves make up one white sprue, the wings another, and other sundry parts being on a third, clear sprue. The wings are provided as left and right parts, each one piece, with the characteristic cannon fairings and wing fences moulded on. Wheel wells are very shallow, which is odd as the entire wing is very thick. Speaking of thick, the sprues and gates are massive, and it will take a razor saw to separate parts from the sprues. It would be wise to – where possible – scrounge around your spares box or cannibalise a Bf109 kit for the undercarriage in case the provided units are broken when being separated. 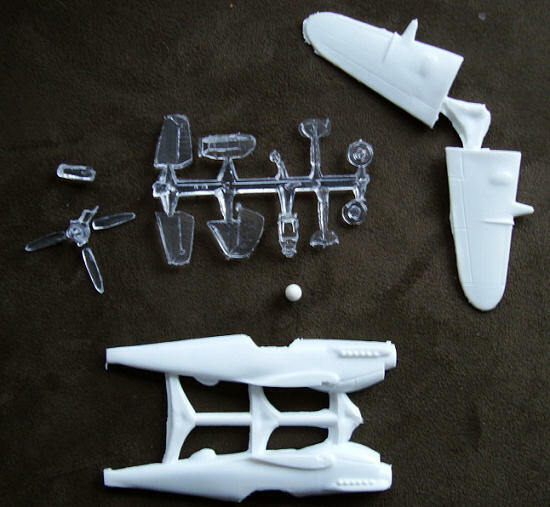 The vertical stabiliser and rudder are one piece and moulded on the clear sprue rather than on the fuselage halves, as are the horizontal stabilisers, seat, wheels, one-piece canopy and the one-piece undercarriage leg and covers. The pointed spinner and four-blade prop – another single-piece unit – was also originally on the clear sprue but somewhere along the road had broken off and one blade gone missing! The remaining three were also broken off at the root, however this can be excused as it has been travelling the world since its birth 27 years ago! In all there are fifteen parts, all with considerable flash. Surface detailing is actually quite nice and will look great under a coat of paint, however the wings will need a fair amount of sanding and then the detail will be lost. Interior detailing is limited to some raised lines which don’t seem to correspond to anything I’ve seen of a 109...the same can be said of the legend “Chris 83” engraved in the right fuselage half! I was over the moon to receive this kit after my successful bid, and then quite shocked and disappointed to see the kit itself. But as I look at it more I see it more as a challenge – don’t tell my manager but I spent the last couple of work shifts thinking about the kit – wondering how I can tackle this. I’m torn between building the kit as it is, or cutting away the nose and mating it to an Academy Bf109G-2. Stay tuned! In short, this kit is doable, but not for the faint-hearted or the newbie...if you can find it!